We have a lot of people asking what’s next for Eve. A lot has happened in the past few weeks, so I’ll run you up to speed on what we know. 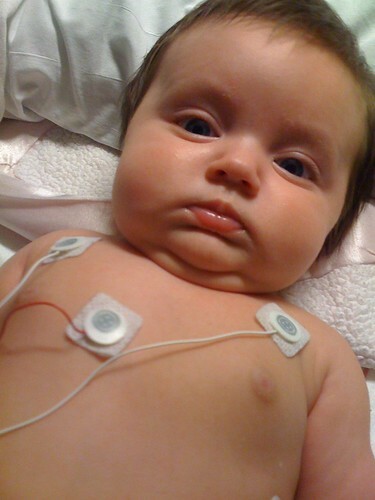 Three weeks ago, Eve was retaining fluid around her heart. She was having trouble eating, and you could see retraction in her stomach when she was breathing. This prompted our Cardiologist to admit her to the 5A unit of the University of Minnesota Medical Center, Fairview, a place we have become very familiar. The doctors were able to monitor her closely, and adjust her current set of medications, while adding another diuretic to help her get rid of the fluid build-up. While there, we made the decision to try to get a transfer for her surgery at Children’s Hospital Boston. Eve has a window of 2-4 weeks to get a procedure done. She looks completely normal, and it is very hard to tell she has congenital heart failure. This obviously is erased when you see the number of medications we give to her, on average, four times a day. We track and triple check everything. 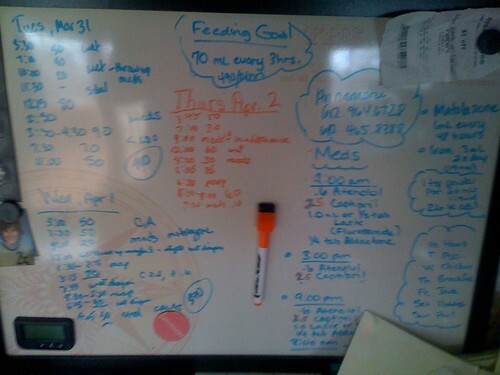 There’s a whiteboard in our kitchen dedicated to this schedule, and it’s constantly changing. If you ever find yourself in need for a top notch Pediatric Cardiologist, Dr. Lazaros K. Kochilas is above exceptional. He’s been very thorough in Eve’s care, and has the patience to answer all of our questions, which we have many more than normal. We would refer him to any friend with this type of need. So here we are, leaving for Boston on Tuesday, April 7th. We’ll be out in Boston for around 2 weeks. We’re not 100% clear what is going to happen, but we’re positive this is the right decision for Eve. I’ll be updating everyone on her progress in this blog. We appreciate all the good thoughts and prayers coming to Eve. It all helps. Very nice page. My prayers are with you, Eve, and your family. Good luck with everything, my thoughts and prayers are with you guys. She sure is a beauty. She will do wonderful, and she has exceptional parent and family along side her! Good luck in Boston. Eve is b e a u t i f u l and you are a great dad to share her progress with your network. Karen and I are thinking about baby Eve, praying and wishing her strength and heath. Your courage and hope transcends all else and provides the perfect place for healing and love. We’re here for anything you might need. Anything. Paul, Eve is in our prayers, as you, Annamarie, Elle, and Jack. Thank you for setting up this page for your friends. Love to you all. Hey Paul. I’d seen your tweets and wondered about Eve’s status. It sounds like she’s in excellent hands! We’ll be thinking about you and your family. Paul – Eve’s in our prayers. We’ll be thinking about her the next few weeks. Glad you mentioned this blog on Babycenter. Now I’ll keep a closer watch. Your family will be in my thoughts and prayers. I hope the flight out was uneventful and that tomorrow goes well. Thank you everyone. Using this technology to stay connected helps us feel like we’re not isolated. I’ll be updating everyone mostly through here, but also on twitter.com/taulpaul with some Facebook mixed in, as well.